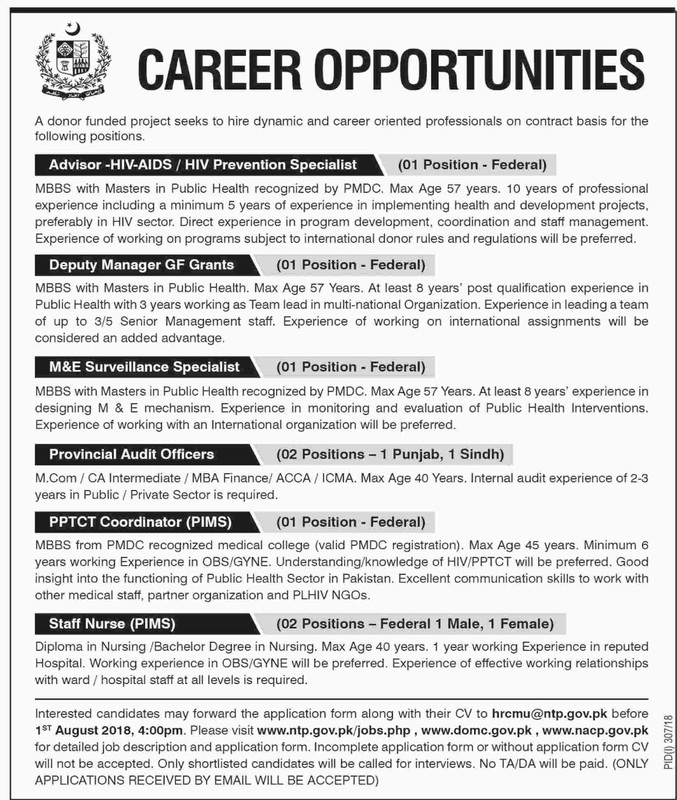 A donor-funded project seeks to hire dynamic and career-oriented professionals on contract basis for the following positions. MBBS with Masters in Public Health recognized by PMDC. Max Age 57 years. 10 years of professional experience including a minimum of 5 years of experience in implementing health and development projects, preferably in the HIV sector. Direct experience in program development, coordination and staff management. Experience of working on programs subject to international donor rules and regulations will be preferred. MBBS with Masters in Public Health. Max Age 57 Years. At least 8 years' post qualification experience in Public Health with 3 years working as a Team lead in multi-national Organization. Experience in leading a team of up to 3/5 Senior Management staff. Experience of working on international assignments will be considered an added advantage. MBBS with Masters in Public Health recognized by PMDC. Max Age 57 Years. At least 8 years' experience in designing the M & E mechanism. Experience in monitoring and evaluation of Public Health Interventions. Experience of working with an International organization will be preferred. M.Com / CA Intermediate / MBA Finance/ ACCA / ICMA. Max Age 40 Years. Internal audit experience of 2-3 years in Public / Private Sector is required. MBBS from PMDC recognized medical college (valid PMDC registration). Max Age 45 years. Minimum 6 years working Experience in OBS/GYNE. Understanding/knowledge of HIV/PPTCT will be preferred. Good insight into the functioning of Public Health Sector in Pakistan. Excellent communication skills to work with other medical staff, partner organization and PLHIV NGOs. Diploma in Nursing /Bachelor Degree in Nursing. Max Age 40 years. 1-year working Experience in reputed Hospital. Working experience in OBS/GYNE will be preferred. Experience of effective working relationships with ward/hospital staff at all levels is required. Interested candidates may forward the application form along with their CV to hrcmu@ntp.gov.pk before 1ST August 2018, 4:00pm. Please visit www.ntp.gov.pk/jobs.php, www.domc.gov.pk www.nacp.gov.pk for detailed job description and application form. Incomplete application form or without application form CV will not be accepted.